It’s a well known fact that Ex Inferis, one of Luxembourg’s most popular extreme metal bands, are perfectionists. This might explain why it took them three years since their last album Defunctus In Heresi to come forward with a new release. Fans may have reason to be disappointed that they only offer six new songs on Hidjama. The opener Heed The Devious emphasises from the start the band’s technical prowess, a virtue which is running throughout the CD. Their songs always come quickly to the point, are played at a pace which is most of the time lightning fast and always at a maximum level of brutality. Their new songs always find room though for melodic guitar lines, bringing them closer to the Goteborg scene, one of the main differences to their previous works. It’s this unrelentlessly fast approach during most of the half hour which makes the feat so remarkable from a musical point of view. Next to four songs that combines an equal amount of melodic death metal and metal core elements, I am mostly pleased by Tail-Devourers which, after a furious start, surprises with quieter and even sentimental parts, and Sweet Venom, definitely the most emotional track on the EP. Hidjama has once again become an excellent death metal album which should appeal to every fan of the band. 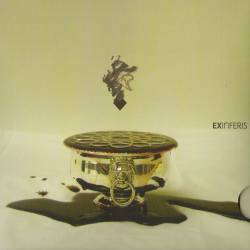 I give one point less than last time as the surprise elements are quite rare, with the songs resulting in a style which is nowadays practiced by a lot of bands, this stripping a little of the Ex Inferis’ identity away. The original cover design deserves praise though.